INSIDE THE CAP with J.I. Halsell: What the Hell are the Oakland Raiders Doing?!?!? What the Hell are the Oakland Raiders Doing?!?!? With NFL execs and agents arriving in Indy over the past few days for the Scouting Combine, an event that is very much like NFL Spring Break, the early talk in Indy has revolved around the contracts executed by the Oakland Raiders regarding Pro Bowlers Nnamdi Asomugha and Shane Lechler. The contract signed by Punter Shane Lechler was for 4 years, $16M in total value, $9M guaranteed, and an average per year of $4M. To put this in perspective, in 2008, on a average per year basis, the highest paid Punters were: Brian Moorman ($2.2M), Jeff Feagles ($1.73M), & 5 Punters at $1.7M. So Lechler's proves to be an 82% increase over Moorman's deal and a 66% increase over Michael Koenen's Franchise Tender of $2.4M. In short, the difference between the highest paid contract at position versus the 2nd highest contract is NEVER 82%; apparently, unless you're dealing with the Raiders. Like Lechler, many people would consider Nnamdi Asomugha one of the Top 3 players at his position; HOWEVA (as Stephen A. would say), that doesn't mean you pay Asomugha (3 years, $45M total value, $28.5M guaranteed, $15M PER YEAR) at a 53% increase over the 2008 highest paid player at his position (the highest paid player was actually Asomugha's Franchise Tender of 9.8M). When comparing Asomugha's new contract to the highest non-Franchise Tender contract, Asomugha's new contract represents a 57% increase over Asante Samuel's contract which averaged $9.5M per year. An added benefit to Asomugha is the fact that his new contract (much like Larry Fitzgerald's current contract) precludes the Raiders from Franchising him at the expiration of this new contract, thereby ensuring that Nnamdi will be in line for another big payday via free agency at age 30. Unlike RBs, assuming good health, the age 30 isn't a bad thing for CBs; so Nnamdi should be in line to add to the $55M he'll earn from ages 27-30. Kudos should go to Tom Condon and CAA who were reported to have negotiated both contracts. They absolutely owned the Raiders on both of these deals. The signing of Lechler and Asomugha came as precursors to the release of another player the Raiders gave huge money to: S Gibril Wilson. Wilson, who came to OAK from NYG via free agency last season in which he signed a contract that made him the 5th highest paid Safety in the game, was cut after earning $9M for 1 year's worth of service. Add Wilson to the list of 2008 free agent busts; a list that includes Jerry Porter & Drayton Florence. Back to the Raiders; what is it with the Raiders?? They were once one of the premier teams in the league, and they're an organization with a rich history, but as of late they've fallen and become the laughing stock of the league. No one wanted to become their head coach, so they settled for Tom Cable. Their personnel decisions have been laughed at for years. 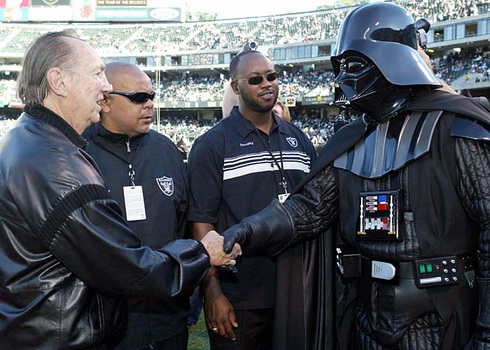 When you look at the Randy Moss debacle, the above-market contract given to Javon Walker, and the contracts given to Lechler and Asomugha, you've got to wonder if, as long as Al Davis is owning the team, will Oakland remain perennial losers. The person (Davis) who represents the triumphant legacy of the Raiders, may in the end, be the sole reason why that legacy is no longer triumphant.